The format of the trilateral dialogue between India, America and Afghanistan can really pick up habitation and name only if it transforms into a ‘quadrilateral’ by including Pakistan. The US announcement said Washington regards the Trilateral Dialogue as reflecting its commitment to “transparency and coordination” on the Afghan problem. The trilateral held its first session in September in New York and five months later on February 18 it is meeting again with Delhi playing the role of the host. The trilateral has nothing substantial to claim to its credit so far as an achievement in the search of a settlement in Afghanistan. Nor is it the case that the three countries are effectively “coordinating”. In fact, the three countries have sharply divergent positions on various critical issues related to the Afghan situation. Thus, there is no shred of evidence that President Barack Obama and his Afghan counterpart Hamid Karzai consulted Delhi before announcing in Washington in December following their meeting in the White House the acceleration of the Afghan ‘transition’ to be completed by the spring. The Indians would have come to know about the development from media reports. Again, Obama gave no advance intimation to Delhi regarding his announcement on Tuesday that he proposed to withdraw 34000 US troops from Afghanistan within the one-year period ahead and that he is determined to wind up the war by end-2014. India is known to be sceptical about ending the war prematurely when an acute security situation prevails in Afghanistan. Again, Washington and Kabul are in close touch with Islamabad to kick-start formal peace talks with the Taliban. The three capitals are coordinating the release of the Taliban prisoners in Pakistani custody. Kabul and Islamabad have reportedly facilitated the travel of the Taliban officials to Qatar with a view to opening the Taliban office in Doha. Some reports suggest that the US is already talking to the Taliban officials in Doha. Now, there seems to be any coordination with Delhi. Also, one thing is clear here. Both the US and Afghanistan recognize the centrality of Pakistan in the search for any durable settlement in Afghanistan. However, Delhi maintains strong reservations about the wisdom of according to Pakistan any special role in negotiating an Afghan settlement. Actually, Delhi feels peeved that Britain recently hosted its third ‘trilateral’ in London with Pakistan and Afghanistan (where the agenda apparently related to the reconciliation process with the Taliban) but India wasn’t kept in the loop. Delhi is particularly unhappy that the ‘red lines’ – talks with Taliban can take place only if they give up violence and agree to abide by the Afghan constitution, etc. – are increasingly getting blurred with the US and Britain in desperate hurry to reach a settlement somehow with the insurgent groups. The London meeting resolved that a settlement would be reached within the next 6 months. Of course, ‘transparency’ is the great casualty in all these currents and crosscurrents. The US and Britain keep Delhi briefed strictly on a ‘need-to-know’ basis and the Indians are more or less left to figure out on their own as to what is actually going on. Arguably, Delhi enjoys much better ‘transparency’ with Kabul than with the US. Karzai is known to have warm feelings toward India. However, Karzai’s equations with Washington remain problematic and it seems there is nothing Delhi can do bring about better chemistry between the two squabbling allies. The ouster of Karzai at the end of his current term in office and his replacement by a pliant figure as the figurehead in Kabul is a strategic objective for Washington. 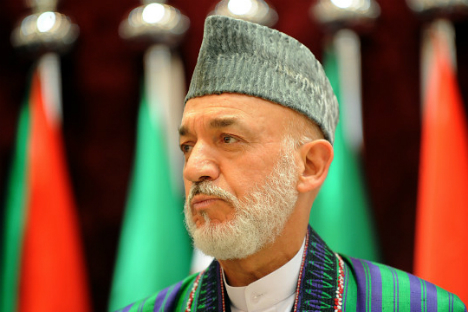 Karzai has shown his irritation with Washington on at least three occasions in the past fortnight. He ignored the US invitation to the ceremony marking the handing over of the NATO military command to a new general consequent upon the end of term of General John Allen. On the other hand, his first ‘engagement’ with Allen’s successor, Joseph Dunford has been to summon the general to his office and reprimand him about the latest instance of war atrocity by the NATO forces in an air strike in the eastern province of Kunar that killed 10 people, including five children and four women last Wednesday. Does this show up ‘transparency’ or ‘coordination’ between Kabul and Washington? Certainly not. But the fundamental contradiction lies elsewhere. Even as the US state department claims to have commonality of interests with Delhi regarding the future of Afghanistan, the Pentagon harbours other thoughts. From the Pentagon’s viewpoint, the bottom line is that the help and cooperation from the Pakistani military leadership is crucial and nothing should be done or said to jeopardise it. Clearly, there are inherent limitations to the US’s cogitations with Delhi over the Afghan situation. The Pentagon’s angst is understandable. According to a New York Times report last weekend, Pentagon hopes to move 60 percent of its accumulated military hardware out of Afghanistan by way of Pakistan, as the American troops begin their withdrawal. The report brings out the stark ground realities of the US-Pakistan tango. Suffice to say, the US’s dependence on Pakistani goodwill and cooperation is at an all-time high level today in the entire 11-year period of the Afghan war. In strategic terms, it is inevitable that the high level of US dependence on Pakistan’s cooperation will continue even beyond 2014 once the American military bases get established in Afghanistan. For a variety of reasons, including geopolitical, Pentagon’s preference will be to rely on the Pakistani transit routes rather than on the Northern Distribution Network. From the US viewpoint, therefore, in comparison with Pakistan, India’s role in the Afghan situation will always remain marginal. What then, is the expectation behind the US-India-Afghan ‘trilateral’? In a nutshell, the Trilateral Dialogue is a pragmatic arrangement. The idea of such a format occurred to the American mind at a time when the US’s ties with Pakistan were in a deep state of chill and Washington found it had very little leverage with the Pakistani military leadership. Any suggestion, howsoever vague, of a US-India condominium would have its own utility as a template in Washington’s ‘psywar’ against Pakistan. In the present instance, the ploy probably worked. The fact remains that in the short period of 5 months since last September when the US hosted in New York the first ‘trilateral’ with India and Afghanistan, there has been a marked improvement in the climate of the US-Pakistan relationship. Unsurprisingly, India too remains enthusiastic about the Trilateral Dialogue. The format helps Delhi to break out of the stark isolation it faced over the Afghan situation. Its voice and opinions regarding the Taliban militancy and/or the reconciliation process involving the Taliban have been consistently ignored by all players; there are no takers for Delhi’s offer to be a key mentor of the Afghan armed forces; the Indian lamentations about the Afghan ‘transition’ fall on the deaf ears of the ‘international community’. The point is, all major players today see Pakistan as the principal protagonist in the Afghan situation and none of them would want to risk annoying the Pakistani military by stressing a special partnership with the Indians. So, what is the Trilateral Dialogue all about? The format indeed helps the US to continue to nudge Pakistan to be more cooperative and the game plan meshes well with the facade of the US-India strategic partnership. Again, it helps to an extent to harmonize the sharply divergent US and Indian viewpoints with regard to the Afghan situation. Most certainly, it enables India to keep itself abreast of the developments – to the extent, of course, that the Americans and Afghans would be willing to share confidential information. The US state department is represented at the trilateral by Washington’s point person for South and Central Asia Robert Blake. But, significantly, the deputy US special representative for Afghanistan and Pakistan Dan Feldman will also attend the meeting in Delhi. There could be a signal herein to Islamabad that the US accepts that India has legitimate interests and a meaningful role to play on the Afghan chessboard. However, at the end of the day, the format of the Trilateral Dialogue can really pick up habitation and name only if it transforms into a ‘quadrilateral’ by including Pakistan as well. Arguably, such a quadrilateral would be the perfect instrument for the US to instil fresh life into the moribund New Silk Road project. The likelihood of that happening seems remote as of now, what with Pakistan single-mindedly working toward limiting India’s influence in Afghanistan and India sparing no breath to caution against the dangers of what it perceives to be the diabolical projection of Pakistani influence into Afghanistan. However, it also cannot be ruled out altogether in the fullness of time.